Mohagen|Hansen Teams with Reach & Restore, Inc. This December, Mohagen|Hansen Architectural Group had the pleasure of teaming with Reach & Restore, Inc. to help give people in our community a brighter Holiday season. Reach & Restore, Inc. provides needy families with resources to provide a sense of hope and be a support to get back on their feet. This may include physical needs such as clothing, household items, furniture, locating housing or transportation and personal needs such as moral support, friendship, tutoring, counselling, or spiritual guidance. The Mohagen|Hansen team was thrilled to contribute Christmas presents and support the work that Reach & Restore, Inc. does in our community. The process to support Reach & Restore is very simple. First, Reach & Restore provided a list of families, names, ages and gift ideas or needs. This list is of recent clients that have continued needs and financial hurdles. 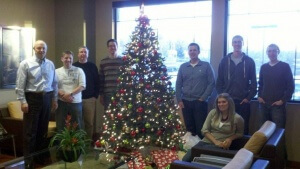 Mohagen|Hansen staff members took responsibility to purchase a gift item, wrap it and deliver it to the office tree. Volunteers from Reach & Restore picked up the gifts from Mohagen|Hansen and distributed them to the families on the Christmas holiday. One of the most special gifts donated was a wedding dress from Bridal Accents Couture and a monetary donation to help with the cost of a wedding for one couple. If you would like to support Reach & Restore, Inc. please visit www.reachandrestore.org.